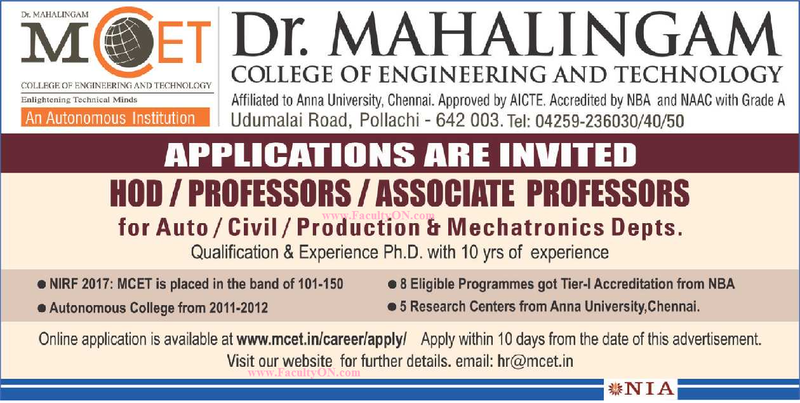 Dr. Mahalingam College of Engineering and Technology, Pollachi has advertised in THE HINDU newspaper for recruitment of Professor / Associate Professor / HOD jobs vacancies. Interested and eligible job aspirants are requested to apply within 10 days from 28th February 2018. Check out further more details below. About College : Dr. Mahalingam College of Engineering and Technology (MCET) is an autonomous, self financing, co-educational institution in Pollachi. 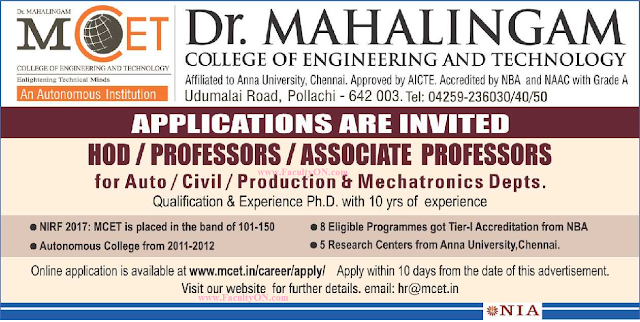 MCET is part of Sakthi Group of Companies with a strong commitment to technical education in South India with their impeccable credentials of an educational lineage dating back to sixty years with an enlightened management under the visionary guidance of Arutchelvar Dr. N. Mahalingam as Chairman Emeritus. Running a blog or website? Want to host your website in best and cheap price? Then you may try Digital Ocean hosting at reasonable price. How to Apply: Interested and eligible candidates are requested to apply online at the web address mentioned below.